I thought this would be great because anything that goes on my daughters high chair gets thrown off, after the first 2 meals she figured out how to get it off. I thought this was the greatest idea ever but I can’t put a bowl anywhere near my baby, suction base or not. He can’t throw the bowl but he’ll sure throw everything in it or bathe in his food. I’m sure it will be excellent when he’s older but he’s 10 months old and still too energetic to be trusted to a bowl full of food indoors. I loved this bowl for my daughter. I always found it’s suction quite strong and it’s only now at over 2 years old that she is able to pull it off, but that doesn’t happen often. It keeps her bowl still while she eats and is a good size for her meals. This was just what we were looking for so I was keen to buy some. Sat perfectly on our highchair. If there’s a hint of water near it won’t stay on and I found a lot of the time the bowl wouldn’t twist out of the base. Made it hard to clean and dry it properly. The bowl scratched very easy too. I love this as it can’t be bumped or thrown off the tray. I lift baby out of the highchair before I take the bowl off. I slide something under it to break the suction. love these! we have them for our twins. we have tried many many suction bowls but this has been one of the best (tied with a tommee tippee one). on occassion my son can pullit off the highchair but not all the time and no where need as quickly or easily as all the other brands we tried. a year later and they are still sticking. My son learnt to remove it quite quick. If I sit and feed them I had to hold it so he couldn’t. I ended up just holding the bowl and after that gave him the bowl and fed him from another. It is a great distraction while you feed him from elsewhere but the bowl was just to frustrating tempting to be of use as it was designed. my son learnt very quickly how to pull this off the table and the food ended up everywhere in the end anyway. i wouldn’t really recommend them for that reason. The times where the suction worked my son would be frustrated because he couldn’t move the bowl. So he would keep trying to pull it off and if it wasn’t attached properly, food would fling further than if the bowl wasn’t attached. Man it’s it’s hard to take that off. This suction pad is just so strong. You first need to take the bowl off which is probably the hardest part to take off. It makes it really hard to dismantle. I tried and tried to get it to suction properly to his high chair tray, but it just wouldn’t stick. Baby managed to get it off every time. Disappointing, as it’s such a great idea! 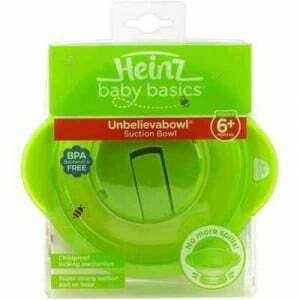 How would you rate Heinz Baby Basics Suction Bowl 6 Months+?